The Lha Ti are an ocean-dwelling race engineered by the Utan Mir in about 3 million B.E., specifically to wield the power of void kith. 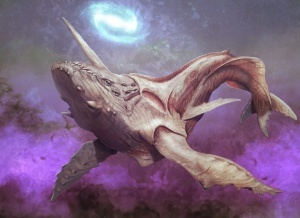 Massive, powerful, and relatively few in number, the long-lived Lha Ti generally spend their entire lives underwater, though the Ixodon do build ships containing huge tanks of seawater that Lha Ti will occasionally use if they have strong reason to leave their homeworld. Even rarer are the most powerful of the Lha Ti, whose might in void kith allows them to fly and, in the case of the mightiest of them, to even soar through the black of space. The Lha Ti are the eldest of the Younger Races. The Lha Ti were created by the Utan Mir as vehicles for void kith in order to assist in the construction of the Voidgates with the Vyar. They were also the only Younger Race to participate in the War of Extinction, aiding their creators who were, unfortunately, annihilated by the Ishvana. Around 47,000 B.E. they formed an alliance with the Ixodon and the Corran, as the Ibyssian Brotherhood. During the Third Cleax Invasion, the Lha Ti played a crucial role in the Battle of the Sarkeen. Little is known about the Lha Ti culture.